NEC’s SMB Wireless (ML440) solution provides your employees true on-site mobility with the productivity enhancing features and functionality of their desktop phone. SMB Wireless allows your employees to stay in-touch with colleagues and customers – resulting in improved efficiency and increased customer satisfaction. SMB Wireless provides a flexible work environment by delivering on-site wireless telephony through the superior quality of Digital Enhanced Cordless Telephone (DECT) technology with all of the benefits of IP. It extends the reach of your voice communications and offers feature transparency between the wired and wireless world without any compromise in voice quality, availability and security. With SMB Wireless, a single Local Area Network (LAN) is used to provide both fixed and wireless telephony, so your mobile voice network easily integrates with wired terminals and applications. All wireless IP handsets operate in the 1.9 GHz frequency band that has been cleared specifically for voice applications, thus avoiding any interference problems with other wireless devices – ensuring crystal clear, secure voice conversations. By combining proven DECT technology in the 1.9 GHz radio spectrum, NEC offers an integrated, secure IP peer-to-peer voice solution that provides high-quality voice and enables you to seamlessly roam throughout your building. Up to 10 simultaneous calls per radio can be transmitted with no loss to voice quality. The SMB Wireless multiline handset ensures an excellent user experience. Its ergonomically designed handset with a large illuminated color LCD display delivers flexible mobility with crystal-clear audio quality, seamless handover between access points and intuitive, easy-to-use features. It also offers a speakerphone for hands-free operation and four programmable keys to enable you to tailor the phone to an individual’s needs. In addition, you can program one of the keys to extend your desktop Direct-Inward-Dial (DID) number to the handset for single number reach – to ensure that you never miss a call while you are away from your desk. SMB Wireless is one of the most flexible, cost-effective, reliable in-building wireless solutions on the market today. A single converged network can be used to provide both fixed and wireless telephony which results in a reduction in dedicated cabling requirements. From site survey tools to the easy-to-use web-based management tool, you can be assured that installations are easy and repeatable. In addition to lowering move, add and change costs through the web-based management tool, no internal call costs are associated with SMB Wireless. Callback charges are also minimized since most calls can be answered immediately – which results in improved customer satisfaction. 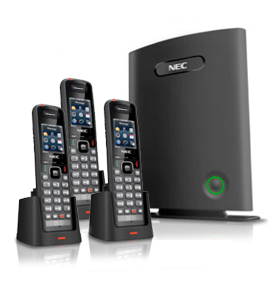 DECT is a worldwide standard which uses advanced algorithms for voice and data encryption. You can be assured that all conversations between the handset and access points are protected against any interference or eavesdropping. The secure air interface along with the uniquely identified handsets and encryption, make the SMB Wireless solution one of the most secure on the market.